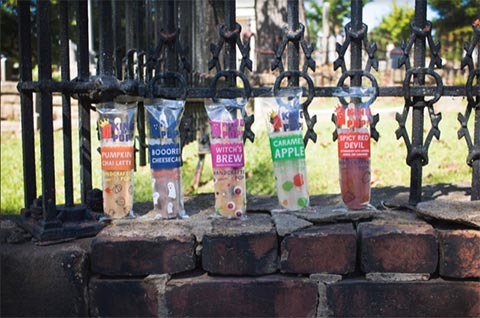 Atlanta, Ga. – King of Pops, maker of innovative natural frozen treats, is using HP SmartStream Collage, HP Indigo’s new automated variable design software, to produce tens of thousands of unique, playfully designed wrappers for its Halloween edition. The world’s first HP Collage packaging was produced by Quality Tape and Label, a Georgia-based converter, from concept to delivery, in only eight business days. HP SmartStream Collage offers a new twist in automated, unique variable design printing by automatically manipulating defined elements within a design, creating new unlimited effects and impact for packaging commercial print, and specialty items. King of Pops was founded in 2010 on an ice cream push cart by brothers Steve and Nick Carse with the mission of becoming positive food influencers. It has branched out with its carts for sporting events and festivals into wholesaling across the Southeast. Now, it is extending its innovation to packaging design using HP Indigo digital printing and HP Collage. The Halloween series features unique wrappers for five flavors: pumpkin chai latte, spicy red devil, caramel apple, witch’s brew, and boooreo cheesecake. The first print run of five SKUs on the HP Indigo 6900 Digital Press totaled 18,000 wrappers, with an additional 25,000 printed in one week. Introduced at Labelexpo Americas and scheduled for worldwide release in November, HP SmartStream Collage is the next generation of hyper-customization software following the success of the award-winning HP SmartStream Mosaic. HP Collage takes this concept even further by beginning the creative process from individual components or seed elements of the design. HP Collage provides brands, agencies and converters with the ability to create virtually endless variations of a set of basic elements as defined by the user. These elements, which can include images, logos or text, are then combined according to individual rules. Users control can parameters such as minimum and maximum number of repetitions for each element, rotation and size. The result can be hundreds, thousands or millions of unique designs for high-value, high-quality print applications. Collage enabling QTL to offer added value for customers Running its business with 90% digital printing, QTL recently implemented HP SmartStream Collage software for its HP Indigo digital presses for labels and packaging. During an innovation-driven meeting with King of Pops, QTL pitched the idea of using Collage to promote the customer experience with their wrappers. The design teams at QTL and King of Pops collaborated to create the unique Halloween themed wrappers. Added value software tools like Collage give an extra benefit to customers and a competitive advantage to our business, added Daniels. A plug-in for Adobe InDesign and Adobe Illustrator, Collage works within SmartStream Designer to take design elements and distribute them randomly by algorithm according to rules. Using the software, virtually unlimited quantities of unique designs can be created. Very large quantities of designs can be created and processed into PDF print files using the cloud-based HP PrintOS Composer. “The benefit of Collage is that it preserves the brand design consistency and then adds in the design elements, which can be seasonal or flavor images, in a minimalistic and controlled fashion,” said Rob Daniels, president, QTL, which also uses HP Mosaic. “Halloween is our favorite time of year to have fun with flavors and packaging. When we heard about this new software, we felt it would be perfect for this run. We also posted wrappers on our social media creating a lot of excitement,” said Danielle Maskery, designer for King of Pops. Company salespeople traditionally opened and twisted the wrapper to present to the customer, but with the Collage Halloween edition the method was changed. “King of Pops vendors are now handing the pops in the wrapper to enable customers to have an experience and emotionally connect with the season and the product as they open it themselves,” noted Jenkins. The move to all-digital printing two years ago is also helping King of Pops realized its mission for high sustainability, including lower waste in wrapper production and composting its organic waste at its production facility, which is especially relevant for its frequent turnover of unique, and seasonable flavors.